A research project on show at the Computer Human Interaction conference in Paris uses a small electrical current to give the sensation of force feedback while gaming. The system, developed by researchers at Germany's Hasso Plattner Institute, involves sticking electrodes on gamers' forearms and then delivering a small pulse of electricity from a 9-volt battery. The pulse makes the muscle contract and it's the fighting of that contraction that delivers the feeling of force feedback. To see the prototype in action, watch a video on YouTube. "Traditionally I think people are going to remember arcades in the 80s or 90s and playing with force feedback," said Pedro Lopes, a Ph.D. student at the Hasso Plattner Institute. "Your car was drifting on gravel or something like that and you would feel physical forces." With the advent of mobile gaming, force feedback has all but gone away, he said at the CHI conference Tuesday. Some other research projects have experimented with delivering force feedback, but they typically involved "motors or exoskeletons or a crazy actuator." "We just deliver a little medically compliant current which causes your muscle to actuate and you feel like you're being actuated," Lopes said. Muscle contractions usually happen at about 12 volts and 20 milliamps, or less, according to Lopes. 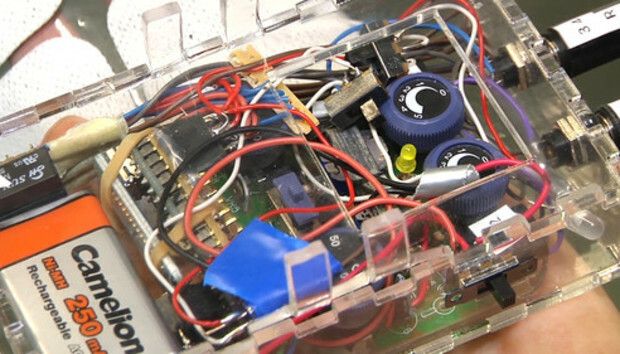 He built the prototype system with off-the-shelf parts including a medical grade signal generator to produce the current. IDG News Service had a chance to try the system in Paris. There's no pain in the muscle, just a contraction, but the skin feels the current a bit different; not a painful sensation, just slightly uncomfortable. The prototype is quite bulky, but Lopes wants to slim it down and make it wireless. "I'd just have a bracelet with electrodes inside," he said. "[It would be] all Bluetooth communication and you can just have two gaming bracelets with force feedback." Zapping conference attendees is becoming more commonplace at CHI. Last year, students from Japan's Meiji University added electricity to food to change its taste. Their idea is that electricity can mimic the taste of salt allowing people to consume less of it. They were back this year with more electric food. Both groups made conference attendees sign medical waivers before wiring up.